The real deal behind this oft-talked about document. Headed to your first IEP meeting and not sure what to expect? Or maybe this is your first time teaching a student who has an IEP, and you’re not sure what to do. No worries, we’ve got you. First, some background. The Individuals With Disabilities Education Act (IDEA) is a federal law that entitles all children with learning disabilities a free, appropriate education. Children who have a disability or qualify for special education must be provided with an education that meets their unique needs, provides access to the general education curriculum, and meets state grade level standards. 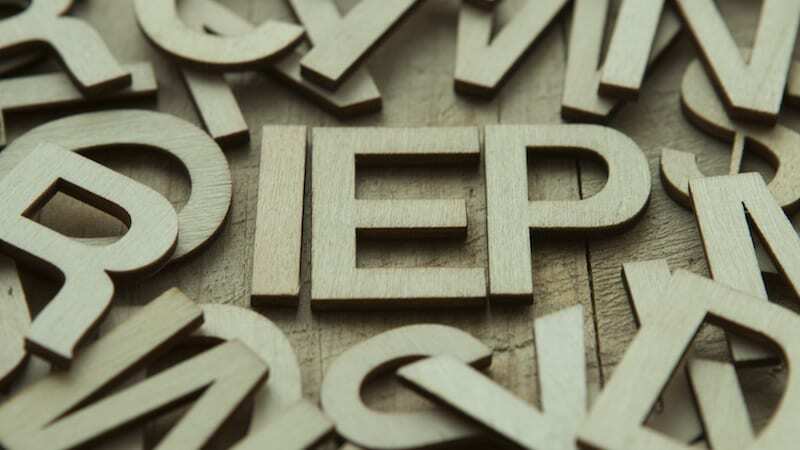 So what is an IEP? IEP stands for Individualized Education Program. An IEP is a legal document that clearly defines how a school plans to meet a child’s unique educational needs that result from a disability. The IEP is the cornerstone of a child’s special education program. The goals of an IEP are twofold: to set reasonable, measurable goals for the child and to also specify the services the school will provide. Autism Spectrum Disorder: a developmental disability that mainly affects a child’s social and communication skills, and sometimes behavior. Deafness: a severe hearing impairment that prevents a child from processing language through hearing. Deaf-Blindness: a combination of a hearing and a visual impairment. Hearing Impairment: hearing loss that is less severe than deafness. Intellectual Disability: below-average intellectual ability. Multiple Disabilities: a child with more than one condition covered by IDEA. Orthopedic Impairment: an impairment to a child’s body, no matter the cause. Other Health Impairment: conditions that limit a child’s strength, energy, or alertness. Specific Learning Disability: a learning issue that affects a child’s ability to write, listen, speak, reason, or do math. Speech or Language Impairment: a range of communication problems such as stuttering, impaired articulation, etc. Traumatic Brain Injury: a brain injury caused by an accident or some kind of physical force. Visual Impairment, including Blindness: partial or complete loss of sight, not correctable by eyewear. The creation of an IEP is a team effort between school personnel, the qualified student’s parents, and sometimes the child. Examples of school personnel include the child’s general ed teacher, special ed team members, and experts, such as counselors or psychologists, who can interpret assessment results, District representatives and other interested parties, such as other teachers or staff members who interact with the child, are also included. What information does an IEP include? An IEP must include these three components, at the least, to meet the requirements of the law: present levels of performance, goals, and services. This is information about how the child is doing in school and how their disability affects their progress and involvement. Information about their academic achievement may include observations of classroom teachers, results of state and district standardized tests, as well as special education evaluations. Information about a student’s functional performance include an assessment of language development, social skills, and behavior. An IEP must include measurable goals for the student that can be reasonably accomplished in a school year. The goals are based on the student’s present level of performance and focus on the student’s needs based on their disability. The IEP includes a description of how the school will measure a student’s progress toward meeting the annual goals. It also includes how often educators will provide progress reports. Once an IEP is created, the team must decide how to put the plan into action. The IEP spells out what kind of special education support and services the child will receive, for instance speech or occupational therapy. In addition, it spells out any accommodations, modifications, and supplementary aids the student will receive. Modifications are changes in what is taught or expected of a student. For example, if a student is reading below grade level, the team must determine which texts to use to teach content. Accommodations are changes in how a student shows what they’ve learned. An oral exam might be given to the the student instead of a written one. Supplementary aids include special supports that help the student in the general ed classroom, such as having a one-on-one aide, using specially prepared graphic organizers, or being allowed to use a computer for writing instead of paper and pencil. The IEP will also include the beginning dates for services as well as the anticipated frequency, location, and duration of services. To learn more about IEPs and supporting students with special needs in the classroom, check out our WeAreTeachers—First Years group on Facebook. It’s a spot just for new teachers to find support and chat about teaching life.